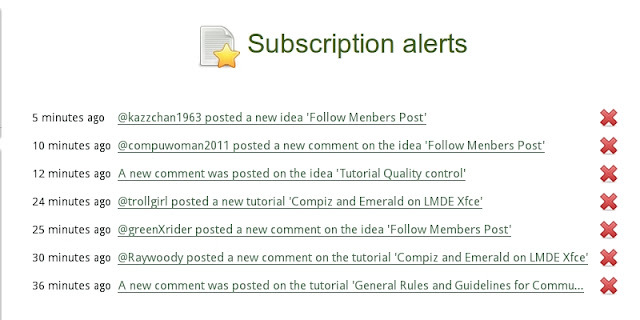 It would be nice if we could receive notifications (alerts) when 'our friends' and/or 'remarkable members who have not formed a friendship with us yet' posted a new idea, a new tutorial and a new comment. What about putting Follow button (link?) on each members Profile page like below? kazztan0325	 Thank you @dagon for putting this forward! I (and maybe many members also) would welcome stalkers in this community as long as the stalkers would not bother us. And I myself also would become a good stalker to follow my favorite members posts. I'm sorry I replied too late. Tonya	 Great idea! I support. waterchan	 +1: Keeps us better informed about useful ideas and tutorials posted by our favorite members. kazztan0325	 Thank you @blueXrider and @compuman2004 for your support and praise for this idea. kazztan0325	 Thank you, @sunewbie ! And I agree with your suggestion: "there should be a "followers list" for each user and some XP points awarded for each follower." It would encourage members to contribute to this community more eagerly than now like you said. I think the conventional system of 'Mutual Friends' is not so "social". I also hope it will make the site feel a bit more "social networky" like you said. trollboy	 Nice ideas. It will make the site feel a bit more "social networky"
Alexio	 I also support this idea! 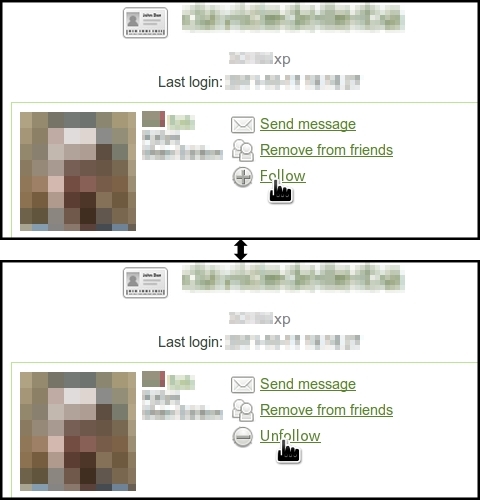 Also, there should be a "followers list" for each user and some XP points awarded for each follower. I think that this approach is relevant to encourage the contributions to the community as you get more followers when you contribute regularly with something useful like good ideas, tutorials and reviews (for software and hardware). RayWoods	 I feel like a bit of a lurker but YES, I like this idea.